Connectivity is a word that can have many meanings. In the world of conservation, it is central to the essence of healthy, viable and biodiverse ecosystems. To Haida this concept cascades to deeper levels of meaning, where Gina ‘waadluxan gud ad kwaagi (interconnectedness) means "everything depends on everything else." The concept of Gina ‘waadluxan gud ad kwaagi elevates the meaning of interconnectivity to include connections to the natural environment as part of both the world that surrounds us and defines that which we are made from. Gina ‘waadluxan gud ad kwaagi is something that the Council of the Haida Nation and the Nature Conservancy of Canada (NCC) aim to support, strengthen and restore in the Gamdis Tlagee Conservation Area. It is a central guiding principle to next steps of management in this rich habitat. In 2018, the Council of the Haida Nation (CHN) and NCC started a partnership to co-manage and restore an area on the northeast side of the Kumdis River Estuary that was subject to clearcutting in 2010. This piece of land completes a network of conserved lands. 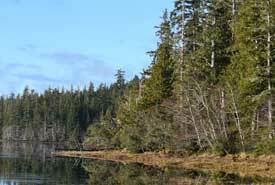 These lands protect a rich and productive salmon-bearing area made up of streams, wetlands and intertidal ecosystems. Estuaries are critical for the survival of many species of fish, birds and aquatic plants. They serve as both a filter and buffer, cleaning water and protecting landscapes against environmental and human-caused disturbances. While this conservation area has experienced disturbance, this unique partnership provides an opportunity for CHN and NCC to come closer to achieving a state of giid tlljuus (balance) in the Kumdis River Estuary through careful management and restoration planning. A primary focus for achieving giid tlljuus at Gamdis Tlagee is the restoration of the many networks of streams, wetlands and smaller tributaries that form intricate networks on the landscape. A dedicated team of fish biologists from CHN and Fisheries and Oceans Canada are looking at ways to restore and re-connect these waterways. This could mean redefining stream channels, removing heavy loads of coarse woody debris or modifying stream road crossings. Hydrological systems are dynamic ever-changing components on the natural landscape. CHN and NCC will approach restoration action and planning with yahguudang (respect), keeping in mind the power of these hydrological systems. Together, CHN and NCC will consider many new approaches, past learnings and understandings, and respond to future developments in a manner that respects both the cultural and ecological values of the local community.